Stained Glass: BrightSign media players drive a simulated stained glass display on the atrium’s ceiling-mounted LED display.El Palacio de Hierro is an upscale chain of department stores in Mexico, with its flagship store located in Polanco, Mexico City. 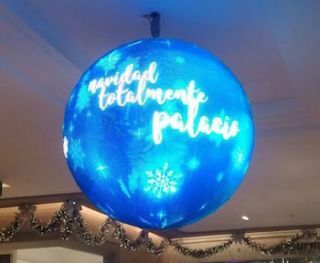 Known as “Al Palacio de los Palacios” (“the palace of all palaces”), this particular location is comprised of more than half a million square feet of retail space, earning it the distinction of the largest department store in Latin America. El Palacio de Hierro recently completed a $300M renovation, which included extensive updates to the entire department store. The crowning component of this project was to be a large, overhead stained glass structure, mounted high above the shoppers below. But due to time and budget constraints, creative and technical consultants at Basha designed a 60-inch LED sphere and full-ceiling LED display installed atop the store’s 66-foot-high main concourse. This budget-friendly stained glass alternative has become the most striking component of the entire installation. Integrator Basha designed a 60-inch LED sphere that hangs from the 66-foot-high main concourse ceiling.In addition to the 60-inch diameter LED sphere and patchwork of 90-inch LED displays mounted on the ceiling, digital signage is featured prominently throughout the massive department store. This includes outdoor screens located at the entrances, as well as interactive kiosks located throughout the facility. These interactive kiosks serve as wayfinding devices for customers and provide access to detailed information about each of the department store’s various retail establishments. BrightSign’s 4K digital signage media players are used throughout the installation, managing content across the entire network of displays. This includes 19 90-inch Samsung LCD displays in the atrium, one 1.92x3-meter LED display in Vaijes, one 18.24x4.48-meter LED display, one 11x10-meter ceiling-mounted LED display, the 60-inch diameter LED sphere, and a video wall comprised of 20 55-inch LCD displays.